I don’t think there’s a more stunning location in Britain for a castle than that enjoyed by Bamburgh Castle. If you have been there you know what I mean. If you haven’t, then you should! Indeed many people believe that Bamburgh Castle is the finest in all England. It sits high up on a rock cliff overlooking the North Sea with views towards Holy Island and the Farne Islands and the drive approaching it is very special for the castle simply dominates the horizon. I’ve been to Bamburgh Castle several times and on every occasion I never cease to be amazed at how magnificent it looks. You cannot fail to be in awe of the people who actually built it; the sheer effort and planning involved in its construction must have been mammoth. 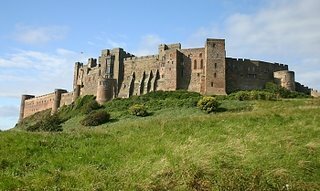 Having parked our car at the foot of the castle (left is a photo we took of Bamburgh Castle from the car park below), we walked up the fairly steep drive to approach it. As it was a beautiful, sunny day we decided not to go straight up to the castle but to venture a few hundred yards beyond, down through the sand dunes and onto the beach. I can close my eyes even now as I write this and feel that sea breeze on my face and recapture the panoramic, open views. What a setting for a medieval castle! It’s the kind of place you just can’t imagine existing – until you go there. We had 2 cameras with us that day and I can honestly say the shutters didn’t stop clicking for quite some time. For those interested in haunted castles, Bamburgh has its own, striking ghost story. Read about ‘The Pink Lady’ on our page about haunted Bamburgh Castle. 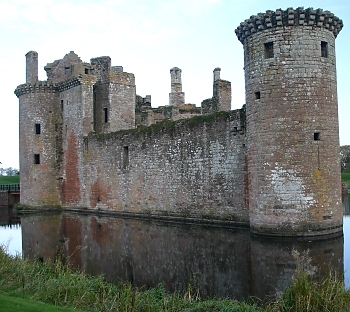 For those interested in medieval architecture, the oldest, surviving part of the castle is its Keep, believed to have been constructed in the mid 12th century. Today the Keep houses an armoury as well as firearms and crossbows. If you’re interested in what is open to the public at Bamburgh Castle, just follow the link to the official website.